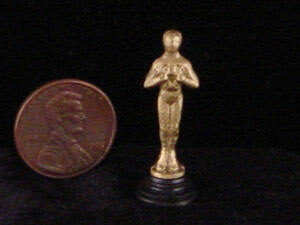 Gorgeous miniature film award statuette, cast metal handfinished in 18k gold leaf. 1¼" (31mm) tall. 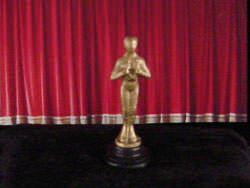 Perfect for any miniature actor's mantelpiece! 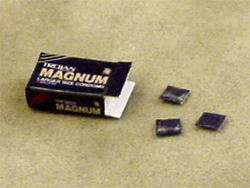 Just what every modern dollhouse needs—a box of condoms by the bed! 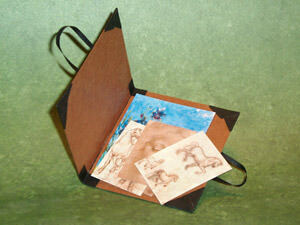 Handmade box measures &frac38;" (1cm), and comes with three individual packets that measure &frac18;" (3mm) each. The wrappers don't open, but each one has the telltale "ring" made by the contents! 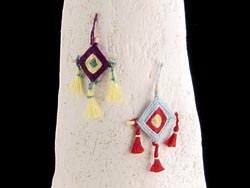 Traditional southwestern 'God's Eye' ornaments in 1:12th scale, woven just like life-size ones. Three colorful bands of handtied thread with hanging tassles. Approximately ½" diameter (12mm). Your choice of Purple & Yellow or Turquoise & Red. Fancy metallic Christmas Ojos available separately. 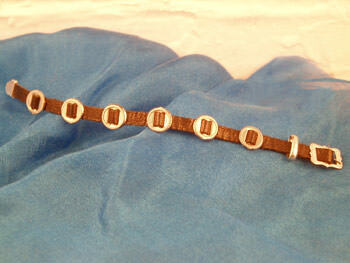 Exquisite handmade New Mexican concho belts in 1:12th scale, perfect for any southwestern scene or doll. The leather belts are decorated with six beautifully engraved miniature conchos. 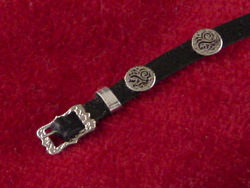 The fancy engraved buckles work, so these belts can be worn by a doll or displayed in a scene. 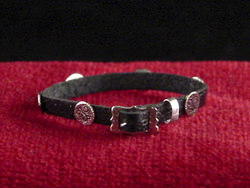 Available in black or brown, with solid conchos or slotted conchos. Belts measure &frac18;" wide by 3" long (3mm x 8cm). 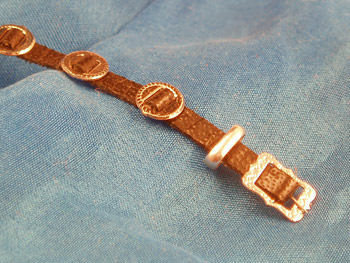 The tiny engraved conchos are each a mere &frac18;" (3mm) in diameter. 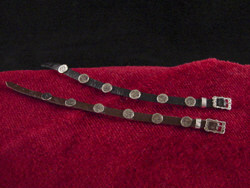 The slotted conchos are 5/32" (4mm) in diameter. 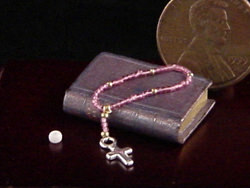 Beautiful tiny rosaries, in perfect 1:12th scale. 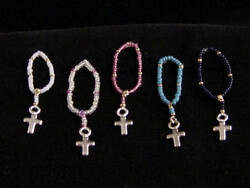 Each rosary is made of miniscule antique Italian glass beads strung on silk thread and measures just over 1" long (29mm). 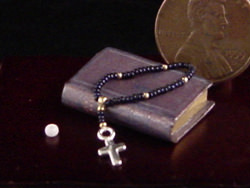 They have the proper number of Ave and Pater prayer beads and a sterling silver cross. The Italian glass beads are over 100 years old; beads this small are no longer made. 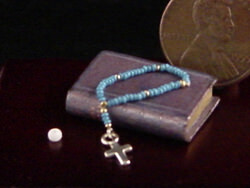 A standard size 11 seed bead is shown for comparison, so you can see how truly tiny the prayer beads are. 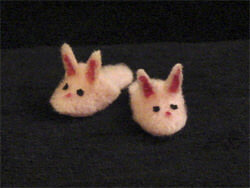 Adorable tiny handmade pink bunny slippers, approximately &frac58;" (17mm) long. These would look perfect next to a bed or bathtub. They can also be worn by a doll. 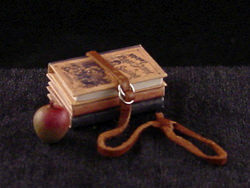 A beautiful set of miniature reproduction antique schoolbooks, bound with a leather strap and working double-loop buckle. The books and the strap look well-used, as though they've been lugged back and forth to school many times, and probably left sitting on a playground more than once! 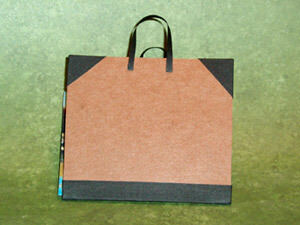 Books have blank pages and are ¾" tall (19 mm). They are removable from the leather strap. Apple not included. An essential for miniature artists, students, architects, and engineers. 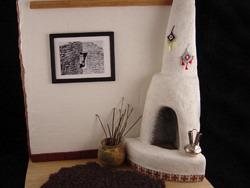 Handmade 1:12th-scale portfolio with sample artwork (may vary from that shown.) 2½" x 2¼" (64x57mm). 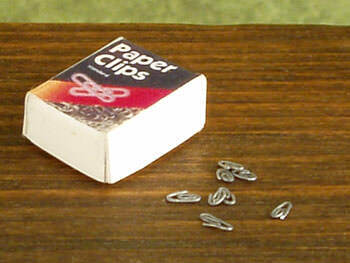 The tiniest paperclips you've ever seen, and they can even be attached to tiny papers! 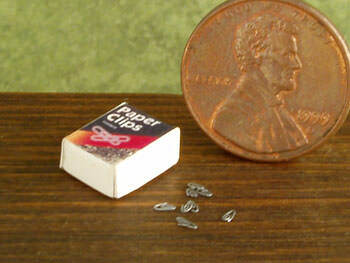 Handformed in 1:12 scale, each paperclip is just 1-2 mm long. 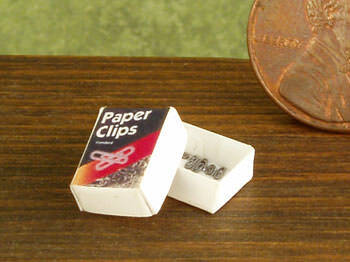 You get 10 clips, boxed and ready for your miniature office.